Up top! Hanna, decked out for Halloween, wants some props on this special occasion and this special episode. What is Alison handing Speicer in this scene? Tune in to the Pretty Little Liars Halloween special and find out. No, Spencer isn't going to Wonderland. She's just dressed up like someone from that fairy tale for Halloween. Looking good, ladies! 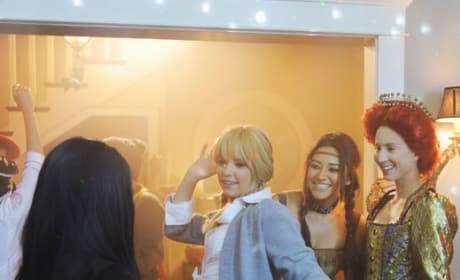 You gotta love the costume choices made by all four Liars in this Halloween sneak peek. The Pretty Little Liars are all dressed up in this photo. 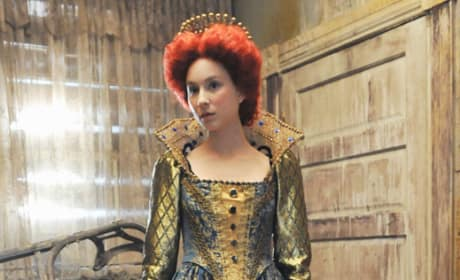 Viewers will see them like never before on the 10/19/11 Halloween special. Yes, this is a photo of Alison DiLaurentis when she was still alive. She's featured prominently in the special Halloween episode.